Today, day 46, belongs to Pranab. By this evening he will be the second person to finish the 3100 mile race. He, who has run the race, 3 times before, will however be the first runner to set a new personal record. In a race in which seconds count like diamonds, he will best himself by nearly a day. There is a lot that can be said about this serious, disciplined, and often funny Slovak champion. Somehow however, his performance here itself, speaks much more eloquently than anything that I can say. At this place, in which courage, strength, and determination are tested with each step, of each mile, over many thousands of miles, he has been superb. He shows me, what he calls, his 3100 mile toe. My camera does not do justice to the object you see here, which does not in my opinion resemble any of the digits attached to my own feet. He says his big toe, has been like this since day one. He also says it has caused him pain every step of the way. What is more amazing, is that on day 14, he lost nearly an entire day from the course, because of his skin allergy. He came back the next day, after finding a solution, and then ran 69 miles, 3 miles more than the next best finisher that day. In what, that can only be called a spectacular finish, he ran 74 miles yesterday, the most he has run here any day, at this years race. He will only have 60 miles to go today. There is a conspicuous empty chair at the course this morning. No doubt tomorrow there will be another. Stutisheel who has less than 400 miles to go walks by the drink table and says, "it must be August, there are bees everywhere." And if Diganta's mom is reading, she has a little less to worry about. He has run more than 60 miles now for the last 2 days. And so Pranab steps to the starting line one last time. The man in blue beside him cannot help but think that tomorrow will belong to him. Grahak has just 120 miles to go. There was never any doubt in Pranab's mind that he would come here and run this year. He did not however train, like he would have liked. When he arrived, he was not thinking of records or glory, only of self preservation, and to finish. I ask him as tactfully as possible, if he was not fit, than why would he come here, and put himself to this the ultimate test of endurance. He says simply, "I came because he asked me to come." That 'he', being of course his late Guru, Sri Chinmoy. 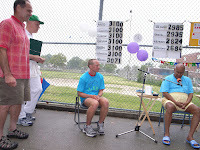 Over the 3 p revious years, that he ran here, Sri Chinmoy would always ask who was going to come back the following year. It was always framed as a request, but the implication in the question, was more like, 'will you all not come back again.' He tells me that he, without hesitation volunteered last year to come back. He says, "I would be stupid, not to do his last request." And adds confidently, "I knew it was the right thing to do." The physical reality however, he brought to the starting line on day one, was not pretty. Over weight and out of shape, he says of the race, "It was the last thing I wanted to do physically." But self-transcendence, in even the humblest endeavor, requires self discipline, courage, perseverance, and of course the intangible one, surrender. He tells me about just a small portion of his suffering, including the last 10 days, which he describes as, "lots of pain." He describes the delicate balancing act he has endured in terms of his mental and spiritual approach to the race. How on one hand he must push and yet not go so far as to be stressed out. How to achieve his very best outwardly and yet to keep track of how inwardly he is responding to challenge and difficulty. He says, "I want to do my best. I want to keep happy but also be focussed." He describes this focus in relation to the approach used by other runners. He does not criticize their tactics but for himself he wants to run honestly and, "make every lap in a pure way. Every lap, it is a golden opportunity." He describes, that it is possible to take short cuts. These are not cutting corners outwardly but more like not taking responsibility for your behavior and actions on the course at all times. He suggests, that the correct inner approach, is always there for you. "That thing is just waiting there for you." And, that once you accept and embrace that way, you will understand it is the reason you are here. For him it is important to, "cry for the the highest. If we don't do this thing we just prolong our time. You are here." His hands sweep wide across the sidewalk we are running on. "You are here, it is a tough experience, but it is the perfect way for Guru to take you through." He says how each year he has learned and gained much here. "Important things," he says he has gotten here, "every year more and more." Of his Guru he says, "He is present as he used to. It is still under his control, I felt it in the hospital." Of that difficulty he describes it as an inner block that manifested itself as a skin rash. He say s, "The thing I had was my resistance, it had to be broken. It was so obvious this experience." It seems that it was a matter of acceptance and surrender, the outcome being, "everything changed, everything really changed. After this I was running on a different level." As for Sri Chinmoy's very tangible connection to him and how he runs today, "he told us what to do. He has taught everything. He has told us in so many ways. He is gone from direct reach. It is just up to us to get there. Because he is waiting there." Pranab's mom Purabi has taken turns with one of his sisters, Padapa, to be a helper at the race. It is a job she takes, with a similar seriousness to her work, as her son does to his running. She is no expert at the needs and whims of an ultra distance runner, but she is a mom, and tries to help in the best way she can. She also tells me, how she tries to help all the other runners. While we are talking she is cutting up bits of carrot to put on to the top of open faced sandwiches. She says of her experience here, that all has taken place so fast. But also, that being here is transforming, demanding, and at the same time peaceful. She describes an atmosphere here, that for her, is charming. It is created not just by the runners but also by all who come and help, and everyone. I ask her about the influence of Sri Chinmoy on the r ace. She describes for me, that how last year, when he came here so often, there was so much excitement when he came and then there would be the down side when he left. When he came she says, "you were in heaven and then it changed to something else." But nonetheless, of his presence and energy, she says, "you can feel it remains here." On a deeper level, "the experience we are having of Guru on the inner level is not so changeable." As for being here, there is no place else she would rather be. She says for her, "it is the most important thing at this moment." I tell her, that it is a unique situation, that Pranab is in. At first his sister helps, and then his mom. She pauses for a moment at this, and I feel like I have touched a delicate nerve. There is a tear in her eye, and I apologize for being inappropriate, and she tells me no. She describes for me simply, that her whole family cares deeply for Pranab and for this race. She says, that at this moment, when he is about to finish, she wishes her daughter Padapa was here as well, to celebrate and enjoy it with her and Pranab. And then 13 hours pass, and the mere 60 miles left to run disappear like grains of sand in an hour glass. It is a big moment for the little country of Slovakia. The Counsel General Igor Pokojny is here with his family to see a new Slovakian record being made. It happens so quickly, the final few steps to the finish line. Everyone is proud at what Pranab has done here over 45 days, 13 hours, 39 minutes, and 54 seconds. He will be the first to cross the finish line. But it is a place he has known so many times before. And too today, he will drink once more from victory's cup, a sweet reward that he has drunk from 4 times before. The sheer weight and scope of his numbers can baffle and astound, any and all, who have ever attempted the art of running. For those who have watched at his elbow, or sought his progress from the other side of the world. No matter who you are, either casual or serious. If you have ever laced up running shoes, you can and must be impressed at this slight and gentle man from Finland. We who are shocked at what he can do in one day, and yet he goes on and on for 44 more. Each day he averaged 70 miles. Each step seemed light as a breeze upon a sleepy meadow. Yet most would see his journey, as one done down a merciless path. On the relentless and hard sidewalks of New York. Nonetheless he pranced and ambled and skipped along each day, and seemed all the way, to be slightly above the cares and woes of the city, that rushed with abandon, to and fro, through each single relentless day of his. One that began before the world around him woke, and ended long after, they sought the solace of their beds. Asprihanal, asked for so little, and yet gave so much to those around him. Yet he did not do it for us, and one can also safely say, he did not do it for himself. He did it for the one, who inspired all the brave souls to come to this place, to take this impossible journey. He did it for the one, whose light and love is perpetual, not just at this sacred oval, but wherever there are those who seek the divine within. He ran this long journey to please the one we can no longer see in this world of ours. Yet he is still safely in our midst, whether comforting the tears of our failure or celebrating, in the glories of our transcendence. He who is always within our hearts, Sri Chinmoy. These two will be next, to take their final steps, here at the 3100 mile race. They both will do personal bests, if all goes well, and rightly claim their crowns of self-transcendence. Ananda Lahari, it is safe to say has found the joy in his legs once more. His heart's joy has never faltered. And when our champion arrived this morning he took the time to greet and encourage all who would have to carry on, to complete their most difficult tasks. Whether you have come 11 times before or this is just your first time. The journey is so incredibly long, few would believe you have done it all. That is unless they came and saw you circling here, round and around. Why does she look so fearless, and why does he smile. So many mysteries and unfathomable truths on a scant half mile of concrete. And so he stands at the starting line one last time. In just over 2 hours he will be calling it his finish line. He starts this day, as he does most, scouring the result sheet. But what can it possibly tell him that he does not already know. He has just 13 miles to go. Rather, what takes his interest, is the numbers of those around him. Of those who have been such an integral part of his journey here. Of his brothers and his friends. How well was their yesterdays, and how many more tomorrows will they have. So often he runs alone, because he runs so light and fast. Yet they all hear his footsteps and his jokes, and the only words he seems to have, are ones that are kind and make you smile. He tells me how happy he was here last night. He also tells me of days in which the happiness seemed just beyond his grasp, and yet miracles both small and grand came to light up his face and his heart once more. How that his doubt would fly away from him, like the great bird of prey that once soared across his mind's horizon. How he once had dreams of the great and tranquil outdoors, in which nature's world demanded nothing of him and he demanded nothing of it. Yet in an instant, a raccoon ambling on the path in front of him, startled him from his flight of fantasy, Brought him back to the earth, and his task, and his Guru, ever present in his heart who could show him transcendence on every plane. Here he carries today's prayer. Each day he has been putting it up on a fence, on the far side of the course to inspire others. The first few days the caretaker would take it down, but Asprihanal kept putting it up nonetheless. Eventually the caretaker saw a greater magic being played out around his school and left it there all day. Tributes from his fellow runners. Parvati's Enthusiasm Awakeners were so happy to receive flowers from the runners. They had special prasad for Asprihanal and sang for him as well. And so come the brief final laps. Some know more than others what it took to come and be at this place. There are songs, and crowds, and celebration. All because he stayed out here for 44 days 2 hours 42 minutes and 15 seconds. Not an eternity but close to it, if you have run 3100 miles over 8 long summers. This mileage, by the way, is about the circumference of the earth. Sahishnu will speak of him in glowing terms. This 122 lb flying Finn. who never complains and never gets blisters. The final words belong to the best author, and the inspirer of all those who run here, both on the course and in their hearts.